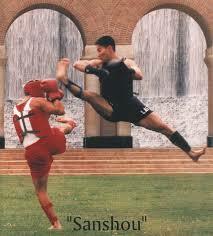 Sanshou, is China’s answer to competitive combat sports. Best described it is a combination of Kick + boxing + wrestling take downs. One can score by knockdowns and ring outs. Of course a knockout will win the match. It is a very straight forward combat sport. kickboxing Sanshou is a martial art which was originally developed by the Chinese military based upon intense study of various traditional methods and combined with modern advanced in sports medicine and training methodology. Sanshou is practiced as a combat sport, meaning that training is conducted with safety equipment, and competitions are conducted under rules restricting certain tactics and techniques designed for the safety of the participants. However, Sanshou is also a complete martial art that teaches striking, kicking, leg kicks, kick catches, sweeps, takedowns and throws. The current sport of Sanshou does not include elbow and knee strikes but most Sanshou teach these techniques as well. utilizes striking, kicking and wrestling but not (”Na”) and/or ground grappling. Originally, elbows and knees were utilized in inter-military Sanshou competition but they have been removed from the international sport version which was established in 1991 with the first world championships. In 1997, the first attempts were made both in China and in the United States to establish professional Sanshou matches conducted in a manner similar to other kickboxing styles such as Muway Thai. Matches are conducted without the protective gear (without headgard, chin guards and the chest protector) and are held in a boxing ring. The Chinese often refer to professional Sanshou as “San Da” an older term which was originally used to describe full contact fighting.